We worked with Robin to chose a camo hat as a give away to our contractor customers. The service was excellent and the customized product was too. Had is exactly as I had hoped! Large selection of hats...found just the one I was looking for. And love the way the embroidery turned out. Just placed order for more today! Lisette is great to work with very quick to reply answered my questions fully. love the embroidery work great job guys. Very happy with customer service, very quick return on questions and receiving my order. Outstanding quality of embroidery. The customer service is great! They get in touch with you right away and sort out the details of your customization. The prices are good too. I did a lot of shopping around before placing my first order. When I received the hats, they were nicely packaged. They turned out awesome!! The running club kids loved them! I loved them! I ended up placing a second order with them for hats for my volunteers. 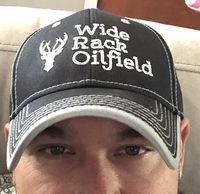 I have ordered the same embroidered hats for a few years & have been treated with great customer service & a quality product! CapWholesalesrs.......Fantastic service.....amazing selection and the best prices anywhere!!!! I order one day and two days later the hats are at my door!!!! Pat your selves on the back. Patricia Purcell Aviamation, Inc. Customized wear was extremely helpful with my order. They were super understanding when I had to request another proof for my artwork and were able to ship/deliver the product on time for my bring my kid to work day. Fantastic turnaround and a great partnership to have! We were very happy with the hat order. The price was awesome and the customer service is top notch! Loved our hats! Color was spot on and stitches were very clean. I will continue to place orders of our company hats with Customized Wear! Pleasure to deal with Lisette and her team. Appreciate the quick turnaround! I love this company and all of its choices!! And the prices are great too! Super high quality hat and the embroidery came out great. I had a customer that needed reflective hats for his biz so I let them do the printing also after sending artwork and it was a pretty smooth transition with great product, excellent printing and quick turnaround. Highly recommend. 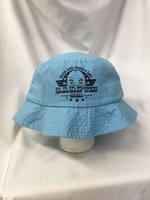 We had been searching for a high quality baseball cap to promote our organization and were pleasantly surprised by the products made available at Customized Wear. 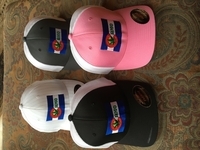 Great customer service on custom hats, they turned out great! I knew that hats I wanted, they had them in stock, and did a beautiful job on the embroidering. We'll be back for more! I can't say enough good things about my experience. The communication was outstanding, customer service was exemplary, shipping was fast, and the quality was top notch. I just placed my second order with them. I highly recommend them! For several years we have been buying printed hats for our family reunion, always friendly and helpful, and the process is so easy. Good quality stuff, fast service, and easy friendly people. Doesn't get any better than that! Was a little struggle with my logo, but ultimately it turned out great! Lisette is a blessing. Will definitely do business again. The only con is the colors that are on backorder. Reviewed Mon, Mar 26 2018 7:47 pm by Randy Ridgeway. I was very happy with the effort put into being sure it was right. Thank you. I’m pleased with the product the Quality control. And follow up. Reviewed Mon, Mar 26 2018 7:18 pm by Randy Ridgeway. The quality of the products and the service are exceptional! “customer service at it's finest” It has been an absolute pleasure doing business with this company. The art of customer service is not lost on them and they really make you feel as if you are the most important customer they have. Always quick to respond to questions or reach out with updates on shipping etc. It is refreshing to do business with a company so focused on pleasing their customers and it is the reason why we will continue to do business with them hopefully forever. Reviewed Sat, Mar 24 2018 12:00 am by Curt S.
I am very happy with the products I ordered. They turned out great! I asked multiple times for different amount quotes as I kept changing my mind and they got back with me quickly. All my questions were answered promptly. They had a problem on their end with the order as when I ordered it would not let me split my volume of sizes. They told me it wasn't a problem but when they arrived, part of the order was wrong. I contacted them and they admitted the mistake and quickly and effortlessly fixed the problem. We all make mistakes or have computers that screw up but to admit it and fix it immediately shows great customer service. Excellence shown in our worst of times is truly genuine! Thanks. I will be ordering more from this company in the future. Kids liked the hats a lot. While fitted hats can be tricky, these seemed to flex to kids and coaches heads. Forgot to upload the picture of the embroidered caps that I ordered for my Dad's 100th birthday. Check this out!